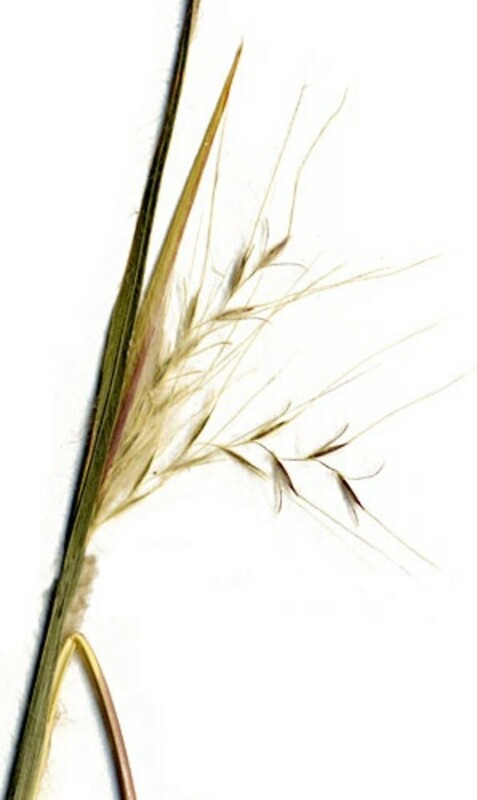 Andropogon virginicus.© James H. Miller and Karl V. Miller. 2005. Forest plants of the southeast and their wildlife uses. University of Georgia Press, Athens. (Accessed 4/2014). Andropogon virginicus is a perennial C4 grass (Downton 1971), 50-150 cm tall, branched above; stems in clumps, pale, waxy green, often bluish, in bloom, yellow-tan in winter, old stems persistent through winter. Andropogon virginicus lower leaves. John Hilty. Illinois Wildflowers. illinoiswildflowers.info (Accessed 8/2017). Leaves alternate, sheaths hairy, strongly keeled, compressed and folded, lower blades 10–20 cm long, 0.2-0.5 cm wide. Flower spike 0.3-0.5 cm, awned, hairy; spikes few-many, with a common stalk, tucked inside leaf-like sheaths; inflorescence of uppermost bract-like blades, 3-6 cm long, 0.3-0.8 cm wide (Clayton et al. 2002+), each enclosing 2-5 hairy flowering branches 3-4 cm long, in pairs or a palmate cluster; blooming and fruiting Aug.-Oct.
Andropogon virginicus (broomsedge) detached spikelets. bugwoodcloud.org (Accessed 8/2017). 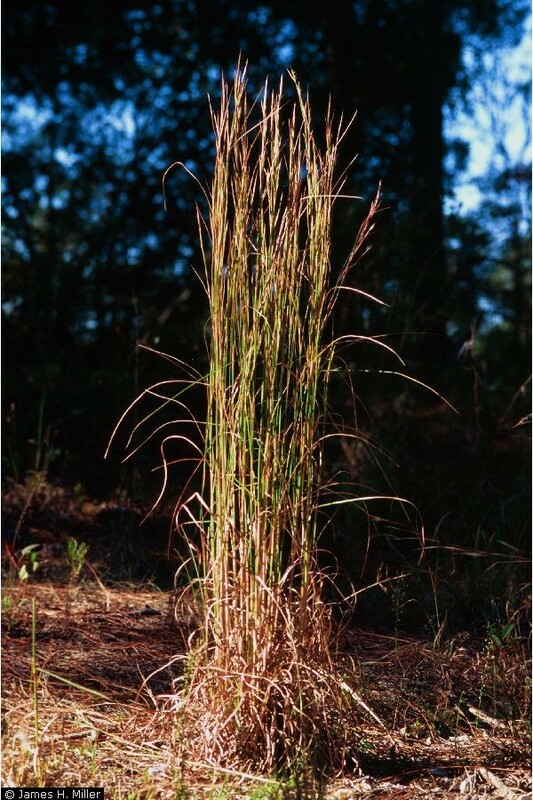 Habitat: Sandy, gravelly soil, in open areas. Uplands to seasonally dry wetland edges. Early pioneer perennial on poor soil, pH 4.9-7. Tolerant of drought and fire, intolerant of shade, salt, anaerobic soils (USDA, NRCS 2006). Andropogon virginicus in bloom. Anna Gardner.Iowa State University.www.eeob.iastate.edu.research.iowagrasses.index.html (Accessed 5/2014). Notes: Plants eaten by deer (Martin et al. 1951). Allelopathic to competitors. Leaves and stems produce chlorogenic acid, ellagic acid and other phenolic compounds that inhibit nitrogen fixing symbionts in other plant roots (Rice, 1972). Plants often infected by the endophytic fungi Myriogenospora atramentosa, Clavicipitaceae (Clay and Leuchtmann 1989). Infected plants may be very toxic due to alkaloids produced by the fungus. 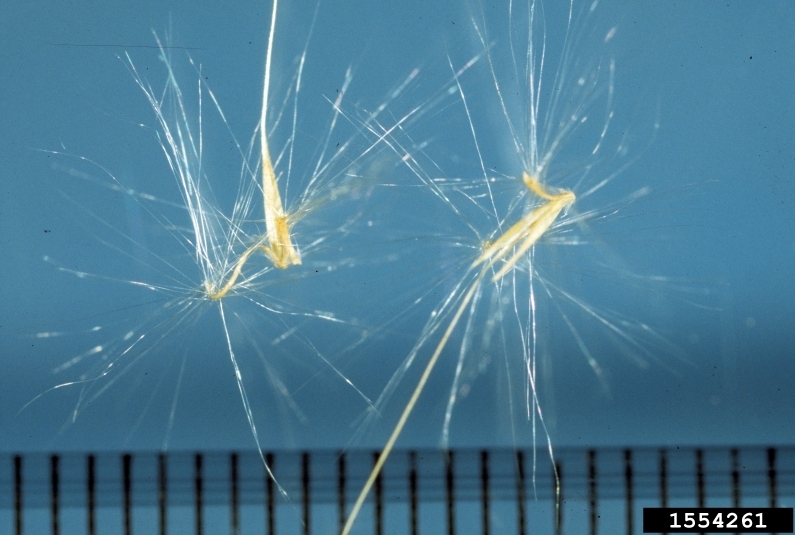 The fungus may infect inflorescences and render the plant sterile, later in the season these inflorescences produce small plantlets that carry the endophyte into the next generation (Clay 1990). 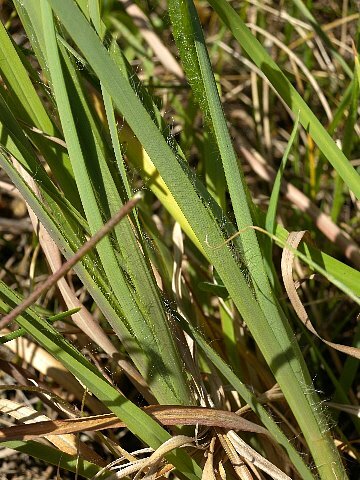 Broom sedge is very similar to Schizachyrium scoparium (see below).